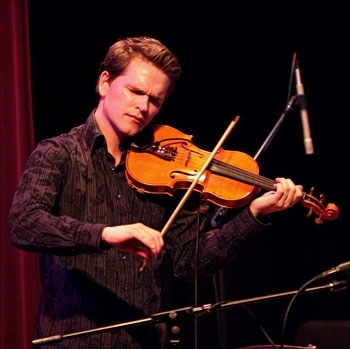 Violinist Mads Tolling played with his quartet at Yoshi's Oakland on Tuesday night. Billed confidently as "Denmark's violin prodigy," relatively unknown bandleader Mads Tolling had, by Monday night's end, reduced a decidedly middle-aged Yoshi's crowd to a wooping, hollering mass of newfound disciples. Taking the stage, Mads and his quartet-comprised of guitarist Mike Abraham, bassist George Ban-Weiss and drummer Eric Garland-appeared, clad in dark jeans and dress shirts with two classical instruments in hand, ready to indulge the audience in a quiet night of, well, something quiet. But what followed was a performance best characterized by its fury and volume. Beginning the show with a nervous crack about the frigid temperature backstage, Mads and his bandmates launched suddenly into a fiery show that produced plenty of heat. More jazz-fusion than classical, the quartet's sound was something most people hadn't heard before, judging by the change in audience reception from the band's introduction to its gracious final bow. Opening its set with the sweet, country-flavored and aptly titled tune "Danish Dessert," the quartet thrived when nourishing Mads' blissful melodies but struggled in other moments, at least early on. The lead violin riffs that guided-and primarily differentiated-each song inevitably dissolved into improvisational no man's lands, during which the band strained to find its collective mojo. The solution lied, as it often does, with a big, bad beast of an instrument: the bass. George Ban-Weiss' switch from acoustic to electric bass occurred before the third song, "The Chicken." Thumping the thick strings with newfound vigor, Ban-Weiss did a solid impression of legendary bassist Jaco Pastorius, who made famous the heavy, bass-driven funk jam. Ban-Weiss stayed electric for the remainder of the show, and having this more forceful third set of strings seemed to settle the band and allow guitarist Mike Abraham's sonic wanderings a greater range of freedom. On songs like "Speed of Light," Abraham and Tolling essentially battled for supremacy, the only victor being an increasingly grateful audience. As the set progressed, an initially staid crowd became more demonstrative, even affectionate, rewarding every solo by the young band with enthusiastic applause. Mads' solo on "Star-maker Machinery" brought the house down and rightly so. Poised like an athlete, legs apart, knees bent, he pumped his arm with an insatiable fury, waxing the sorry strings like a man possessed. Even in the slower moments, the band held the audience transfixed. Softer numbers, like the Danish folk song "Peaceful Quiet of the Forest," allowed for a more subtle interplay between instruments, especially guitar and violin. While Mads' instrumental dexterity lent itself to any tempo, the softer tunes gave Abraham occasion to stretch out, interspersing wandering jazz leads with blue staccato and filling the small, dim theater with warm vibrato. His employment of modest feedback, a harmonic technique not often heard at Yoshi's, seemed to confirm that this night was unlike your typical one at the legendary Oakland jazz club. Not to be ignored were the melodic embellishments of Ban-Weiss and Garland, on bass and drums, whose closing duel established the pair as perfect rhythmic partners. But besides being a virtuoso, mastering the absorbed head sway must have been a requirement for joining the band. None of the musicians so much as glanced toward the audience all night, conveying a sense that their focus was on the music and not the crowd. Completely engrossed in their complex rhythmic relationships, the four seemed wholly invested in the idea that their performance went deeper than simply entertainment but entered the realm of art-something challenging, for both audience and band.